My long-suffering wife has earned that sobriquet. I was a kvetcher long before my cancer diagnosis, ruminating and over-sharing my concerns. But now after 30 years of marriage putting up with my vocalized emotional turmoil, exacerbated by a year with the greatest health challenge of my life, Jody’s had it with the suffering. Jody’s change in attitude started around the time I went into remission last year. I was already worried that sharing my “good news” would lead to a flurry of “congratulations” and “way to go” messages that didn’t address the fact that I’m just in the first part of a long treatment protocol, that I’m far from being side effect free and, as someone with a chronic and incurable cancer, I didn’t deserve any accolades about “beating” the disease. What I didn’t realize is how the remission would also affect Jody. 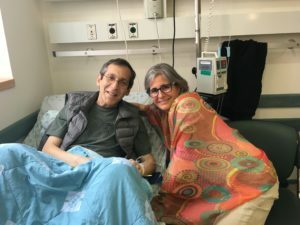 “I’m ready for this cancer to be done,” Jody said one night as I was too fatigued from my most recent immunotherapy session to get up from the couch and walk the dog. “Yeah, me too,” I replied. That’s where self-regulation comes in. Put another way, as Arlin Cunic writes on the website VeryWell, it’s about “thinking before acting.” Or in my case, considering whether I really need to express a particular gripe out loud or if I’d be better off keeping it to myself. Words and phrases like “postpone,” “pace yourself” and “choose what to say” can help one cultivate a more self-regulatory approach to life. Self-regulation sounds self-evident – of course this is how we should be in the world. But it’s not something we’re necessarily born with. We have to learn it. Usually that happens in childhood. Toddlers who throw tantrums eventually figure out how to tolerate uncomfortable feelings without flying into a rage. However, children who don’t feel safe and secure or who are unsure whether their needs will be met, may have trouble soothing themselves and self-regulating. I don’t know if I fit into that category as a kid, but I retain a strong impulse to verbally vent as an adult. That’s the crux of the crisis with my wife. I brought up the topic with my therapist. I remembered how, when I used to work in Tel Aviv, I had a boss who I didn’t get along with so well. He bullied me and I was miserable most of the 3 years I worked at the company. On the long commute home to Jerusalem each night, I would call a couple of confidants on my car’s speaker phone and proceed to growl for an hour. Eventually my friends got burned out, as Jody was now. Offloading some of my anxiety to friends who also care about me could help with the balance, she suggested. “Can they be virtual friends? On Facebook?” I asked. “Better to get together for coffee in person,” she said. Such an old school approach to relationships! The truth is, friends havebeen calling me but I’ve mostly rebuffed them, not wanting to be a burden like I was with my Tel Aviv commute buddies. Instead, I turned Jody into my safe place. “You’re like my personal human Evernote,” I once joked to Jody. As with my favorite note taking app, I reasoned that if Jody could hold my worries, then I could let go of them for a while myself. I love my wife dearly, of course, and the last thing I want to do is cause her pain. So I’ll give it a try. I’ll meet up with friends. I’ll try to keep the volume down. I’ll think before I act or speak. I’ll postpone and pace. Perhaps the same will be true for me. Jody first read me the riot act at The Jerusalem Post. Correction: “Waiter, there’s a fly in my soup.” “Sshh, don’t say anything or everyone will want one!” That’s meant to be funny, of course, but my misrepresentation of Rabbi Aaron Leibowitz’s fly-in-the-soup story in “Judaism’s honesty problem” was serious business. As several readers have pointed out, a fly floating on the surface wouldn’t have made the soup treif once removed. In his talk, Leibowitz spoke of a fly lost in the pot. I apologize for the error.